Activities organized by students include a food drive, performance, panel discussion and simulation banquet. 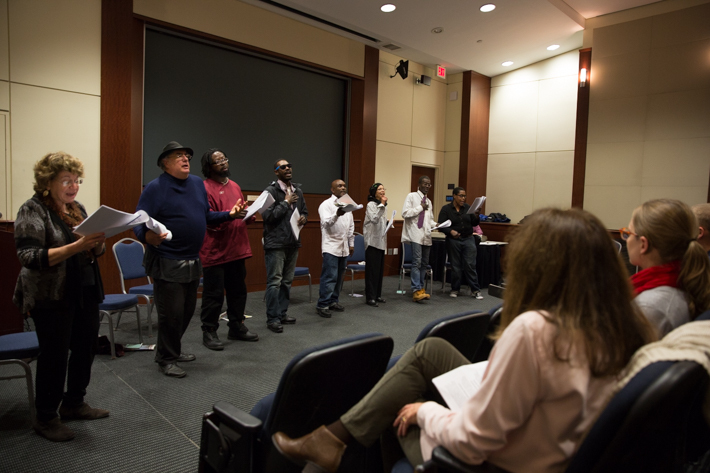 The Street Sense Players put on a play for the GW community. That’s the question the Street Sense Players ask during “Street Talk From The Streets,” a play created to raise awareness of homelessness in D.C. The show’s seven-person cast represents more than just actors. 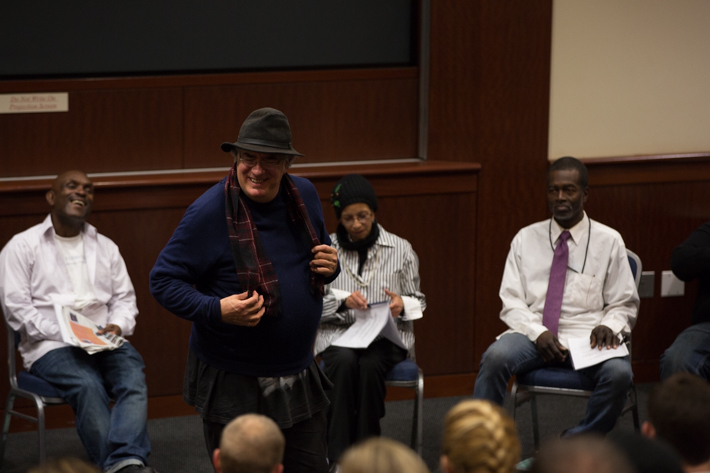 They’re artists, poets and writers who have experienced homelessness firsthand. The George Washington University community got to see a performance of “Street Talk From The Streets” on Tuesday in the Marvin Center Amphitheatre. Through several scenes they wrote themselves, the actors showcased how their involvement with the local nonprofit organization Street Sense has given them strength and a sense of community—and, most importantly, a voice. Directed by Professor of Theatre Leslie Jacobson and sponsored by the Faculty Senate’s University and Urban Affairs Committee, the 45-minute play was one of the programs included in the university’s annual Hunger & Homelessness Awareness Week, which consists of events that shed light on issues related to hunger in the District. Students in “Organizing for Social Justice”—a class led by Vice Provost and Dean of Student Affairs Peter Konwerski, an adjunct professor in the sociology department’s human services and social justice program—put together a majority of the week’s programs with support from the Center for Civic Engagement and Public Service. 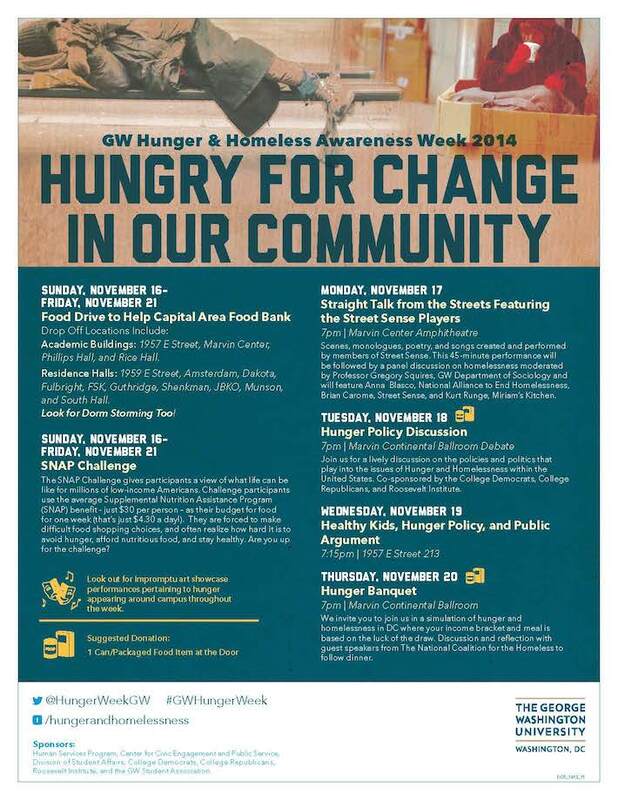 “We hope the Hunger & Homelessness Awareness Week programs and performances help educate our community about issues around hunger locally as well as globally and inspire GW students to make social justice issues a central part of their futures,” Dr. Konwerski said. Senior Michelle Ryngel and junior Jyotsna Dhar have worked as Dr. Konwerski’s teaching assistants this semester, helping to plan Hunger Week activities like a food drive to support D.C.’s Capital Area Food Bank and a simulation “hunger banquet” on Thursday. At the beginning of the semester, Dr. Konwerski split the class up into groups that each organized a different part of the week. The students worked with campus and community partners to find ways to bring awareness of hunger and homelessness to GW. “Sometimes, it is very easy for GW students to get stuck inside the ‘Foggy Bottom bubble.’ The purpose of this week is to spark conversations about hunger and homelessness and to inspire students to create change within their community,” Ms. Ryngel said. In addition to a week filled with events, Dr. Konwerski’s class is inviting the community to take the SNAP Challenge. Participants experience what it’s like to live off the U.S. Supplemental Nutrition Assistance Program (SNAP) benefit by spending only $30 on meals each week—that’s $4.30 a day. The model replicates the difficulties that low-income Americans face trying to make healthy yet affordable nutrition choices. Tonight, the Urban Food Task Force and GW’s First Chapter program planned an education panel, “Healthy Kids, Hunger Policy and Public Argument.” Congressman Jim McGovern (D-Mass. ), a congressional champion of SNAP, and Audrey Rowe, administrator of the U.S. Department of Agriclture's Food and Nutrition Service, will lead a discussion at 7:15 p.m. in room 213 of the Elliott School. Ms. Dhar explained that after participating in Dr. Konwerski’s class last year, she wanted to empower other students and help get them more involved locally. “We are not just members of the GW community, but rather the D.C. community and owe it to ourselves to become aware of the issues that plague the city we currently call home,” Ms. Dhar said. Actors Reginald Black, Chon Gotti, Cynthia Mewborn, Chris Shaw, Robert Warren, Angie L. Whitehurst and Robert Williams Jr. depicted the importance of advocacy and community involvement in songs, poems and sketches during “Street Talk From The Streets.” In one scene, the actors play advocates trying to convince the office of Muriel Bowser, D.C. mayor elect, to invest more heavily in helping the homeless. Following the performance, a panel of representatives from local nonprofit organizations joined the performers to talk about how GW students can get involved in relieving homelessness. 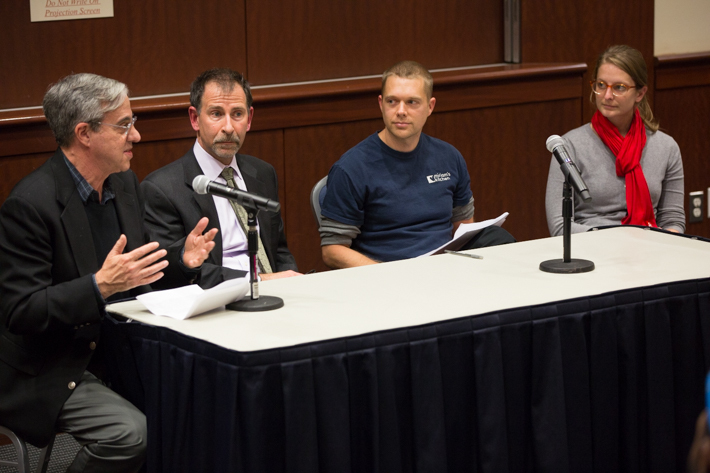 Professor of Sociology Greg Squires led the discussion, which featured Kurt Runge of Miriam’s Kitchen, Anna Blasco of the National Alliance to End Homelessness and Street Sense Executive Director Brian Carome. “We’re going to solve homelessness and become a more morally right nation when we recognize that people have a right to housing—and give it to them,” Mr. Carome said.